Although it's tempting to take the opportunity to order the later 160 amp alternator, the mounting holes are 1mm narrower, so make sure you get the right one. The very first thing to do is to disconnect the negative lead from the battery. You'll need a 10mm spanner to do so. Move the connector clearly out of the way of the terminal to make sure it doesn't move back and make contact. Next we need to make room so that we'll be able to get the alternator out, which unfortunately means disconnecting the feed and pressure pipes from the power steering pump. Next, clamp the power steering feed pipe (the soft one that runs from the reservoir) as best you can (I found it wouldn't clamp particularly well) and then loosen the jubilee clip and gently work it back off the pump. Be careful to avoid spilling PS fluid. Move the pipe out of the way (I found I could route it the other side of the fuse/relay box and leave the end pointing up) and place a rag over the end to catch any fluid egress (and minimise the amount of dust that gets in). 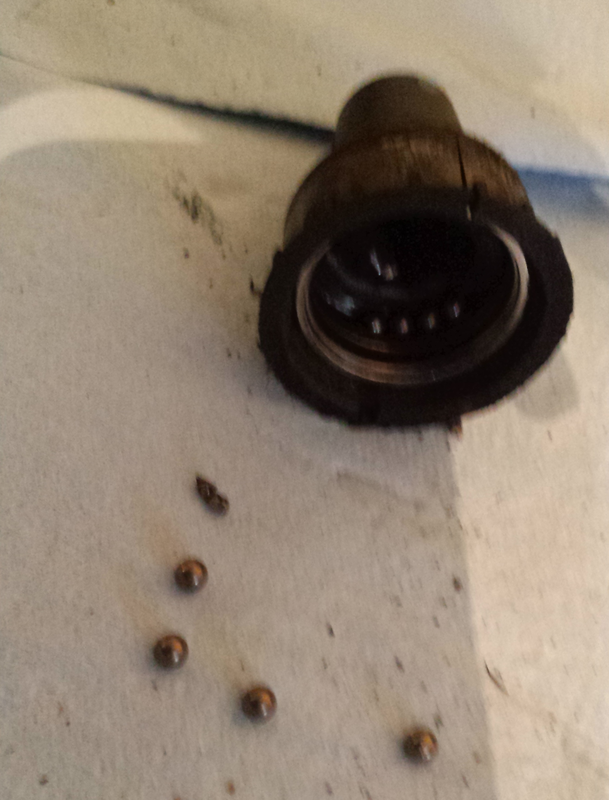 Next, use a 17mm spanner to loosen the union bolt on the pressure pipe, and then carefully work the pipe free. Move the pipe out of the way (it should be possible to move to the other end of the block), and again, place a rag over the end to catch fluid egress. Once the top mount is removed, the lower mounts need releasing. The alternator should now feel fairly free, but probably won't come out yet. They're a pig to get to (as you can't access them from the underside) but you need to slightly slacken (not remove) the aircon compressor's lower fixings. The fixings are identical to the two top ones you've just removed, but you'll need to push your hands past the intercooler feed pipe to feel for them. Loosen them slightly and then see whether it's possible to work the alternator's feet free from the back of the a/c compressor. I didn't need to slacken them too much, though the left foot did stick slightly. Next, we need to physically remove the alternator. Although we've made some space, it's still fairly tight, I found the best way was to tip the alternator backwards and twist slightly so that I could bring it out pulley first. Once out, it should now leave you with a gaping hole. The next step is probably a lot easier if you have an assistant to help, I didn't so I used a mirror on a stick. Trying to install without one or the other (preferably both) is possible but will be incredibly frustrating. 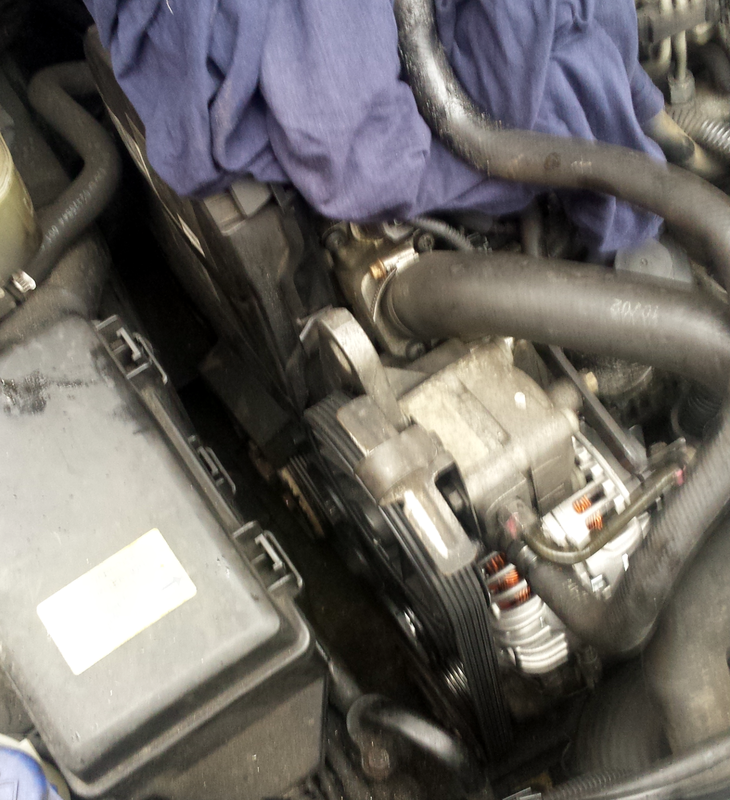 Insert the alternator, the right way up and pulley first into the gap that you pulled the old one out of. I found it goes in much easier than it comes out. Now for the fiddly bit, getting the mounting holes to line up. Getting the lower mountings in is a little harder as you can't look down either end very easily (getting the angle on the mirror proved damn-near impossible), so insert the fixings as far they can go. Then, whilst gently trying to push the right-hand fixing (furthest from the pulleys) in, wiggle the alternator up and down until you feel the fixing slide forward. 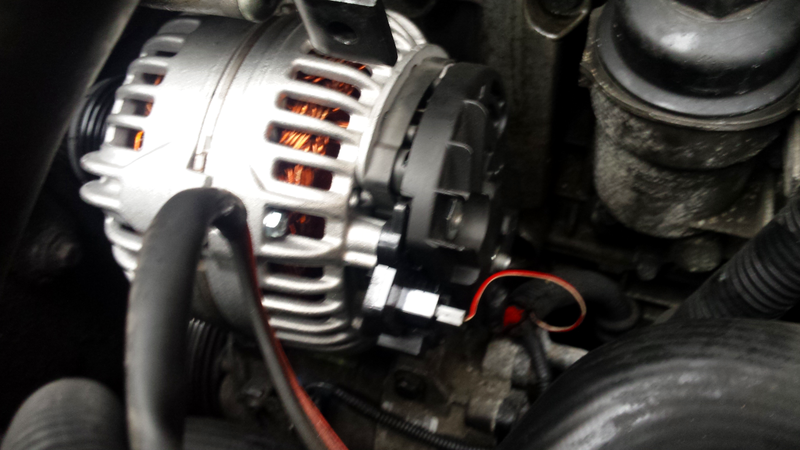 Maintaing position on the alternator, start to tighten the fixing with your fingers. Once it's finger tight, move onto the other fixing and repeat. Once you've got the threads biting on both tighten them down. Now re-tighten the lower A/C compressor fixings. Once those are tightened up, tighten up the alternator's top mount. You'll probably then need to tighten the A/C compressor tops down further. Next, we need to reconnect the power steering hoses, so get a clean dry rag spread out under the Power Steering pump to catch any fluid spillage. Start by reconnecting the Power Steering feed pipe, work it gently over the P/S pump inlet and then tighten down the jubilee clip. Now we just need to refit the belt and the casings - if your routing differs to mine then you're on your own! Pass the new belt around the crankshaft pulley, along the bottom and under the air conditioning pulley, up to the power steering pulley (so you're effectively creating a "L"). Back at the crankshaft pulley, pass the belt under the idler, and around the tensioner. You should now have a loop near the alternator, but because the tensioner is fully at rest won't have quite enough to pass it over. Using a lever if possible (makes things a lot easier), use a 14mm socket/spanner to pull the tensioner forward and hold it securely. Carefully pass the belt around the alternator pulley - I found it fell off the tensioner, so needed to push it back on once it was around the alternator pulley. If that proves too fiddly, gently release the tensioner and instead, unloop the belt from the power-steering pulley, route it around the alternator pulley. 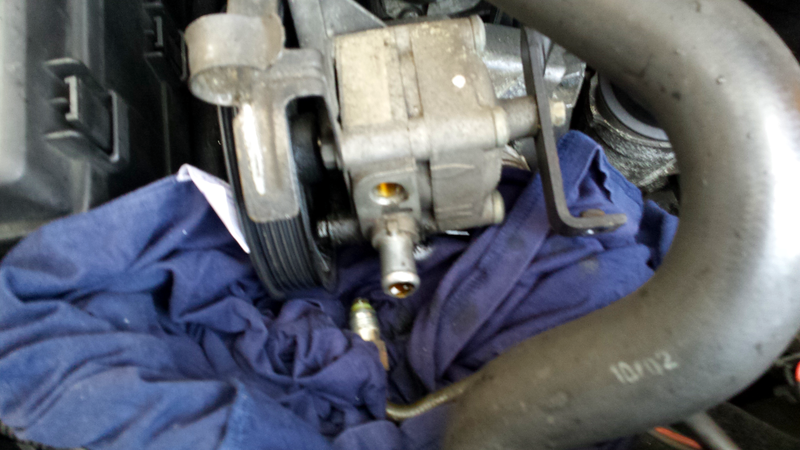 Then pull the tensioner forward again and work the belt over the power steering pulley. Because there's a lip it's very tight, but there's more room to get your spare hand (or an assistant) at the belt to help work it over. Once the belt is around all pulleys, check it's straight and then gently release the tensioner. It should take up the slack and stop (roughly) half-way along it's travel. Next, move all rags out of the way, as we're going to prepare to start the engine. Reconnect the battery negative lead. Make one last visual check that the belt is on straight, and then start the engine. Check that the belt's not visibly moving from side to side (keep fingers away!) and that all pulleys are turning. Put any covers back onto the car, and you're done. Replacing the alternator on an S60 is reasonably straightforward, the most trying bit really is trying to line the fixing holes up when installing the new alternator. It should be possible to do the complete job within a couple of hours, even in the freezing cold. I had an issue with my alternator pulley about 9 months ago, which probably contributed to the early death of the bearing (though it didn't seem to have any play at the time).